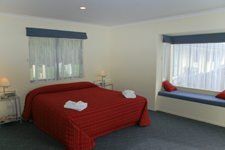 Occupancy: - 2 Persons plus a Rollaway Bed available by prior arrangement. This roomy studio unit is equipped with a comfortable super king size bed that can be split into 2 single beds along with a television, D.V.D. player and wireless internet access. 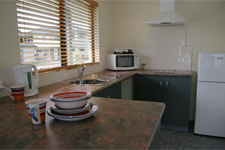 Complete with 2 bar stools and adequate bench space it has a fully self contained kitchen equipped with 2 cooking hobs, microwave, fridge / freezer, toaster, electric jug, fan heater and complimentary tea and coffee. The bathroom has a shower, toilet and hair drier and is stocked with complimentary toiletries.